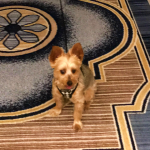 To Be Calimquim » Blog Archive » The Palazzo and Venetian hotels in Las Vegas are now pet friendly! Only dogs at 50 lbs or less are allowed. Unfortunately, cats or other pets are not mentioned in the hotels’ pet policy. However, I would re-check with the concierge or front desk to make sure. You must bring a print-out from your vet to show that your dog is up-to-date on his/her vaccinations. Your dog must be in a crate when leaving the dog alone in the room. I suggest placing the Do Not Disturb sign on your door so that the housekeeping crew doesn’t come into your room. The dog relief area is located outside the casino. 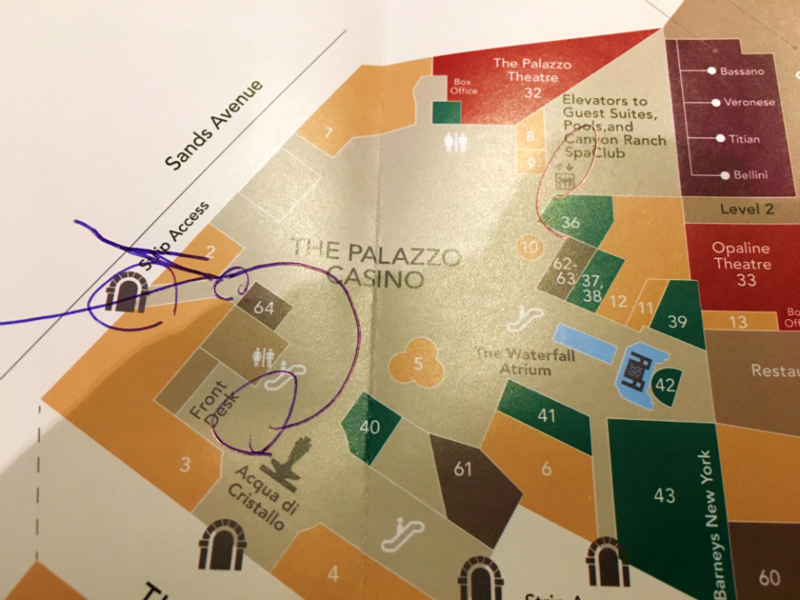 Please see the resort map and picture below to find the location. During the hot summer, the sidewalk towards the dog relief area will be extremely hot. Don’t let your dog walk/stand too long at the same hot area. The dog relief areas and sidewalk will be very dirty. 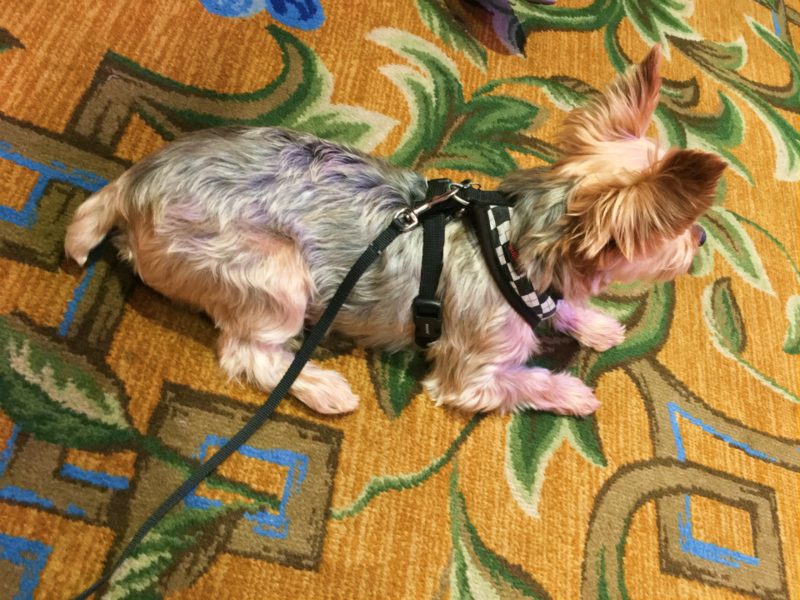 Plan on giving your dog’s paws a good cleaning once you return to your hotel room. There are several other areas with artificial turf that are not as dirty as the main dog relief area. 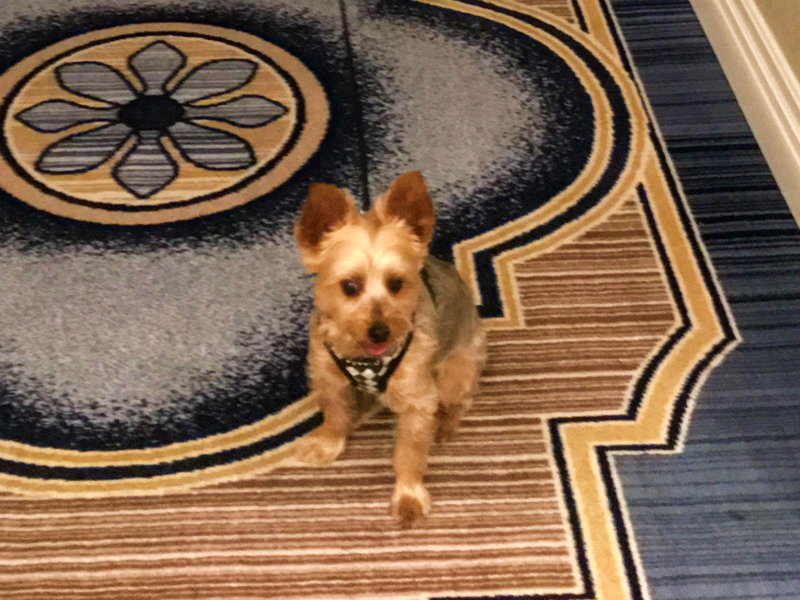 Just walk on the sidewalk towards the Sands Convention Center to find other areas where your dog can do their business. 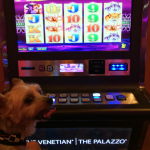 For more info on the Palazzo’s dog friendly policy, click here. Your dog will get a Barkbox welcome package that includes some treats, a chew toy, food and water bowls, and a sleeping pad. 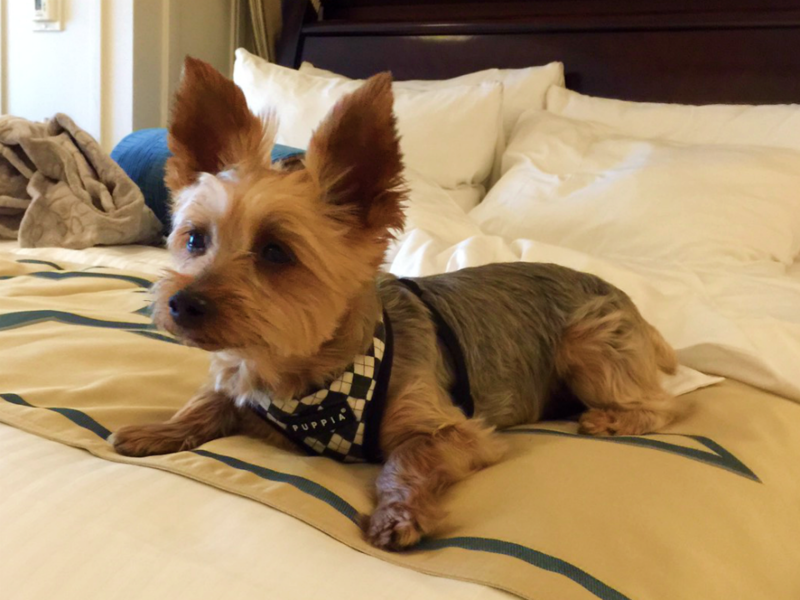 There are no special rooms designated as dog-friendly rooms, which may have a chance to sell-out. 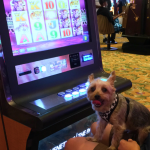 Basically, your dog can stay in any room of the Palazzo. 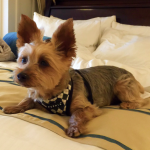 As long as you have a confirmed reservation, your dog can stay with you. 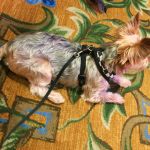 In order to get to the dog relief area, you will have to walk your dog from the elevators, through the casino floor, and up/down another set of stairs and elevator. Unfortunately, there’s no private walkway to avoid all the loud sounds and flashing lights of the casino. There is a bus stop near the main dog relief area. Lots of people will congregate around that bus stop, which may be distracting to your dog. 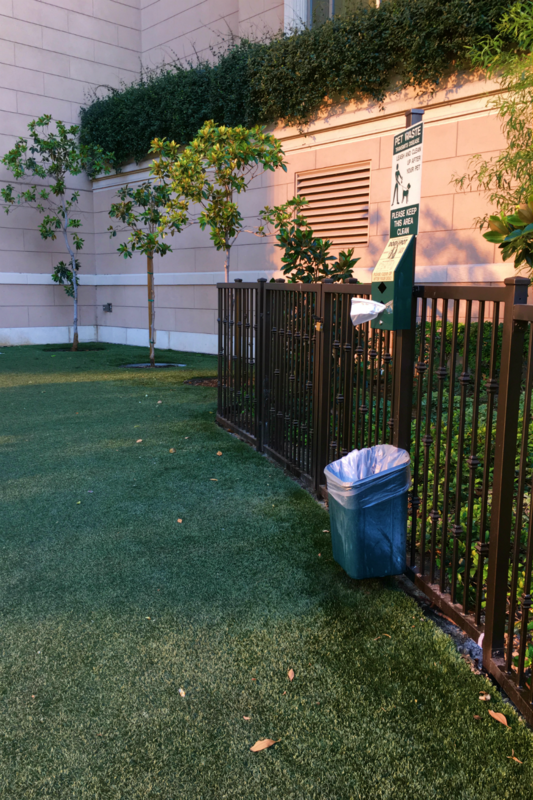 The dog relief area uses artificial grass instead of natural grass. Furthermore, the Palazzo staff doesn’t do a daily wash down of the dog relief area to clean off the previous day’s doggy poop. There will be some bad dog owners who do not pick up after their dog, which leave lots of leftover poop. Be careful where you and your dog are stepping! 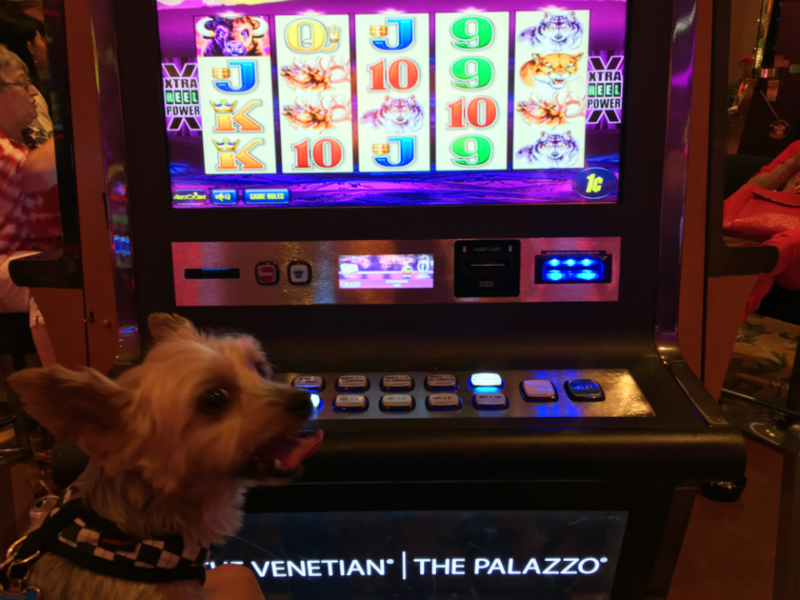 It’s also bad that the Palazzo staff doesn’t re-fill the dog station with actual poop bags. When they do, sometimes they re-fill with normal waste basket bags which are too big. 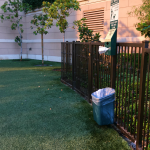 Especially at night, when it gets cooler, there will be some homeless people sleeping on those artificial turf areas that are not the main dog relief area. 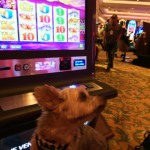 Teddy is surveying the casino floor and waiting for his “humans” to check-in to the Palazzo. 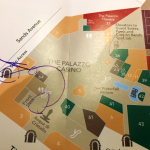 This is floor map of the casino and the location of the dog relief area. Luckily, there is an elevator so you don’t have to use the escalator to get to the first floor. Teddy is back in the hotel room and watching a pay-per-view movie. 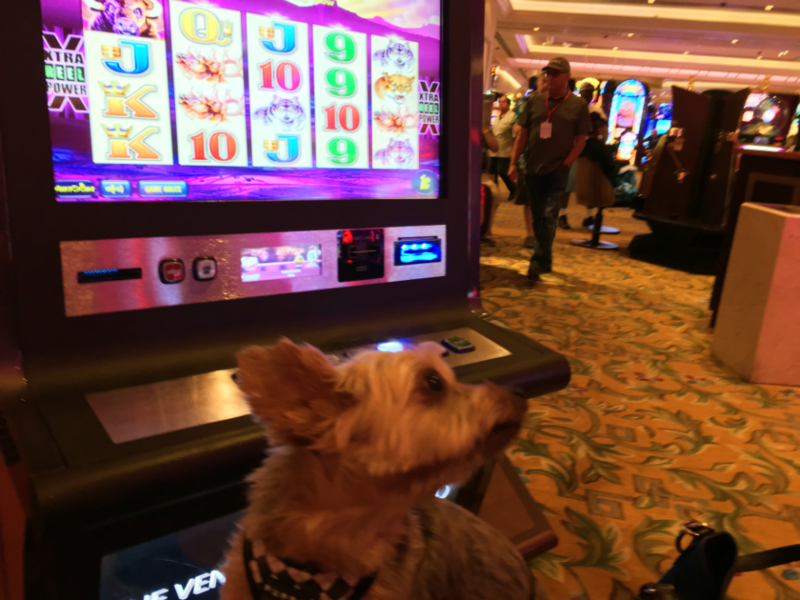 Teddy is going back down to the casino and bring some luck to Mom and Pops when they play slots! 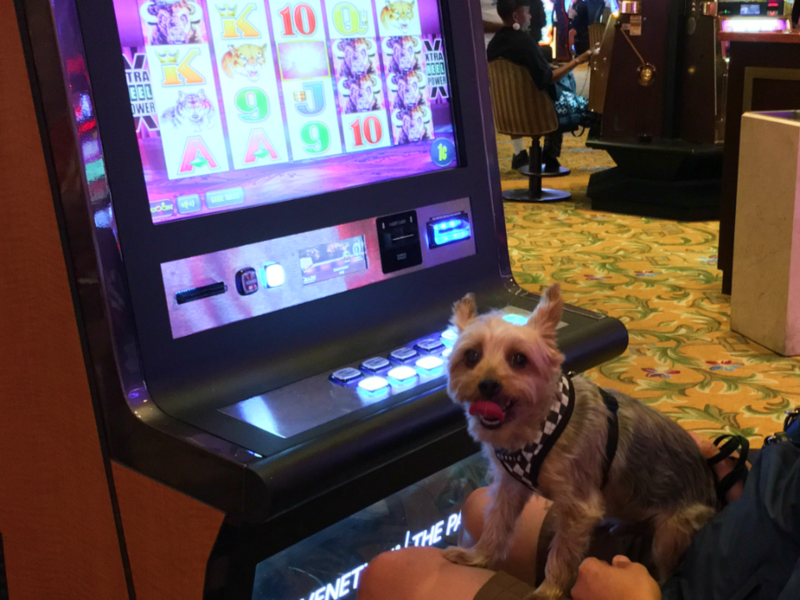 What is this slot machine? I’ll look away since it is too bright for my eyes. Did you win anything Pops? Oh well, I’ll just keep sitting here until you win something. By the way, can I have some water?